In the last post I said that our water filtering process may not be as safe as we’d hoped (see Filtering Drinking Water). I continued researching home water filtration systems, returning each time to the Berkey® system. 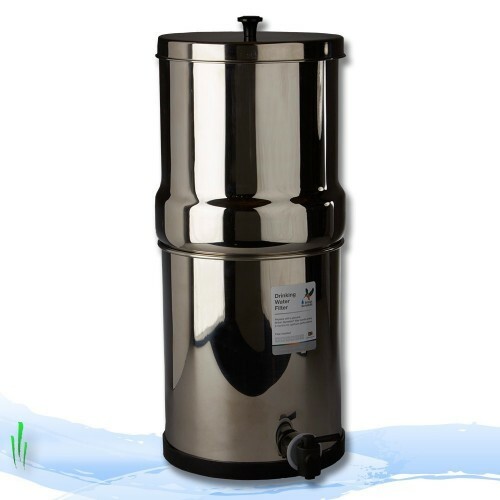 Berkey offers several sizes of stainless steel filter systems that hold a few quarts to several gallons of water. The speed of filtration depends on how many filters one uses, most commonly two or four, and the size of the filter (some are 7″, others 9″). The Berkey filters are ceramic, while PUR® cylinders are packed charcoal. The advantage to the ceramic comes not only from far smaller pores through which water strains and filters, but in longevity. A ceramic filter that becomes clogged can be removed, scrubbed with a plastic pad, and replaced numerous times, adding considerable life to the device. This longevity represents real savings. While we might spend a considerable amount up front for a new filter system (the Berkey® retails for around $260) we would pay nothing further for about 5 years, possibly more. This beats the average $10-20/month we pay for the PUR® replacement filters. Berkey offers several filter sizes and configurations, including ceramic filters in 7″ and 9″ lengths (called “candles”) black filters, which apparently screen more heavy metals, chlorine, and other contaminants than the candles, and special filters that remove almost all fluoride. For our untreated, mostly ground filtered rainwater, ceramic filters should suffice. Filters may be purchased singly or in sets, most commonly 2 and 4. We hope to stockpile these filters to see us through the coming years. That feels more like water security! The Big Berkey® holds over 2 gallons of water vs. PUR’s 1 quart or so per pitcher (capacity of upper reservoir). Berkey filters cost much less than PUR because of the Berkey’s longevity. The Berkey will sit on a counter instead of filling one of our sinks, as the pitchers commonly do. The Berkey cistern is stainless steel, PUR pitchers are plastic. They’re food grade, but all plastic seems to leach into liquids, and they’re fragile. We decided to purchase a Big Berkey® when we began to think about switching to the summer water system. That would be right now. We couldn’t find any for sale in Haines, so we ordered this one from Amazon.com. Not only is the price very low compared to others, but it comes with four filters. While we wait for the new filter to arrive, we’ll continue to switch around our various failing PUR® filters to get by. We’ve begun to fill the pitchers in the early evening, then pour off into a container and refill the filters before bed. We use the saved water for tea and coffee in the morning, and usually have enough water in the filters to fill our morning water bottles. Once we receive the Berkey® and get it up and running, we’ll take the PURs® to the secondhand store. They’ll serve someone in town well, where municipal water shouldn’t pose a giardia risk. As an aside, we realized that we probably don’t have giardia in our water at present. In our day to day use, the PUR® pitchers aren’t perfect. We often pour too soon, slopping unfiltered water from the pitcher’s top reservoir into our drinks. We’ve been lucky so far, but we shouldn’t assume that our water quality won’t degrade suddenly in the future. A muskeg bog feeds our summer water catchment. Moose, bear, and every other local forest animal tromps through there without regard for the quality of our drinking water. Filtration may only provide us peace of mind, but it could also save us from a world of hurt. We received no consideration from British Berkefield for this post. Dammit. Thank you so much for letting me experience a little bit of your Alaskan homesteading world through your blog. I just started reading last week and have been anxious to see your posts. Am jealous for your simple life in the wilderness as we live in the suburbs of Seattle. I like the northwest very much and would like to see Alaska some day. The Berkey water filtration systems are awesome!!! We have had one for a year. Had found out about it from a couple of blogs, Our Traveling Tribe and Chris Beat Cancer. My husband tested the ph of our water after filtration and it came out neutral, pure water is neutral. I feel that our health has improved since using the Berkey since we have many toxic contaminates in our city water. Hope that you enjoy your Berkey very much and it suits your needs perfectly. Hi Molly, thank you for your kind words, and for reading the blog! I appreciate hearing that you and your family use and like the Berkey. We’re very anxious for ours to arrive!